What can you do to treat “Diabetes Eyes” conditions? The painless office Argon Laser is the mainstay of our therapy to treat leaking/bleeding vessels. Before your laser treatment, you may also have a diagnostic Fluorescein Angiography performed in the office. This involves a small injection of a dye in a vein. Special photographs are then taken to help identify “problem areas in the retina” for treatment. If you have diabetic retinopathy, you may not initially notice changes in your vision. 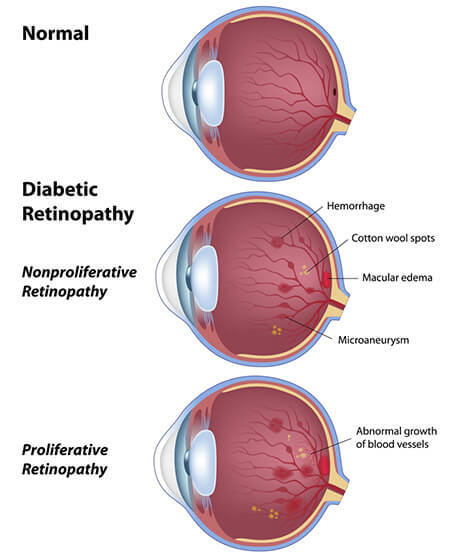 The earliest phase of the disease is known as background diabetic retinopathy or non-proliferate diabetic retinopathy (NPDR). In this phase, the arteries in the retina become weakened and leak, forming small, dot-like hemorrhages. These leaking vessels often lead to swelling or edema in the retina and decreased vision. People with non-proliferative diabetic retinopathy may experience no difficulties with vision. However, those who do experience problems, may develop macular edema or macular ischemia. Secondary glaucoma is also known as neovascular glaucoma. With this complication, delicate new blood vessels in the eye may form a new group directly on the iris, blocking the outflow of fluid from the eye. This condition results in increased pressure of the fluid in the eye, and can cause optic nerve atrophy and loss of the full visual field. Treatment involves the application of a laser to the leaking areas. Standard glaucoma treatment with drops or diuretics may also be recommended to lower intraocular pressure. For more information on glaucoma click here (LINK).